From 6:00 PM to 7:00 PM everyday! Filipino Homecooked Dinner: What better way to fully experience a destination than sample local, authentic food! Set-up at the historic The Ruins, enjoy traditional Filipino dishes usually prepared in Filipino homes and enjoyed by the family. 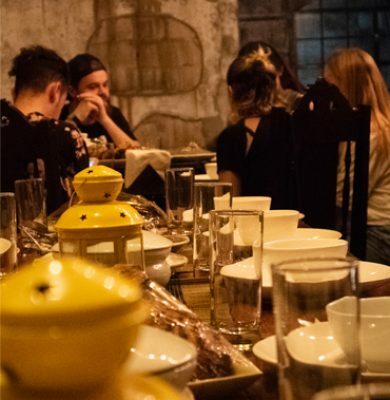 Experience “salu-salo”, the culture and celebration of eating together in the Philippines, with fellow guests and get to know them more. After all, the hostel becomes your home and your roommates family! 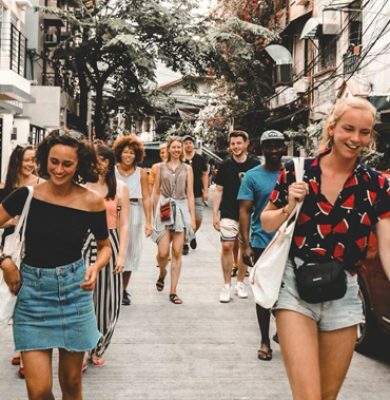 Walking Tour: Before you knock back some tipples and enjoy the amazing nightlife of Z Hostel’s neighborhood, get a good feel of the area with our daily walking tour around the community with a Z Hostel crew as your guide. It’s also a great way to navigate your way around Poblacion and see where you could hang out, dine, and do your errands during the rest of your stay. It starts around 4:30 every afternoon and just show up at the lobby a few minutes before. Sunset Session: Come up our world-renowned Roofdeck around 6 in the afternoon for the daily Sunset Session. All in-house guests get one free cocktail, watch the sun go down along the Manila skyline, and make new friends. 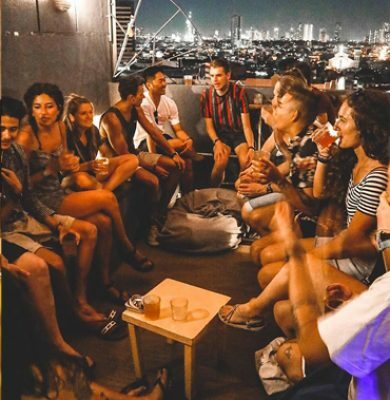 It's packed with great crowd on a weekday; on weekends it's a rooftop party! Pops and bites of Southeast Asian flavors and refreshing drinks in a rooftop garden with charming decors. Need we say more? Welcome to the good life! Everything about this Costa Rican lounge spells c-h-i-l-l. From reggae music, wooden beach chairs, and refreshing cocktails and bar chow make Pura Vida the best interlude from city life. Pura Vida mae! Tales of Filipino culture and heritage served in plates of sumptuous appetizers and mains. Bite into history as you sample authentic local cuisine with surprising twists and spins. Did we say they have craft beers, too? Your neighborhood “sari-sari” store given a facelift and is now the hottest yakitori place this side of the metro. Skewers and beers in a Makati sidestreet, you better not miss it. Fall-off-the-bone ribs, tender juicy beef brisket, crispy chicken skin, and more — it’s like you died and went straight to barbecue heaven. And heaven is just right next to the hostel. Almost like an adventure in the middle of the metro — this cocktail and craft beer bar is becoming a corner staple where neon signages and tropical plants set the mood for a good after-work drinks and weekend frenzies. Old house, beautiful soul. Step into a historic structure breathed with new life: contemporary art pieces, a beer and cocktail bar, and an urban hydroponics garden. The Ruins also regularly hosts events celebrating culture, music, and arts. One of the neighborhood’s best-kept secret: you kinda have to know the right people (a.k.a. Z Hostel crew) to know where it’s actually located. Enter a red door and step inside a whole new level of chill vibes, jazz and house music, and ice-cold tipples. The zing of Hong Kong with the soul of Poblacion. This is new speak easy - style bar guarantees no MSG and only authentic flavors in their food and a banging selection of drinks. Tea- infused gin, anyone? Dubbed as the Silicon Valley of social entrepreneurship, Gawad Kalinga Enchanted Farm has become the hub for social tourism in the Philippines. From bottled lemongrass teas, organic personal care products to artisan chocolates, different products have been developed by local farmers and townsfolk under the mentorship of the farm university. The tour includes a visit to the farm’s livelihood programs as well as lunch prepared by the GK team, with food freshly sourced from the farm. How does lying on a giant hammock in the middle of lush greens sound to you? Or go bird-watching while standing on a giant metal spider-web suspended above rock formations? How about some rope courses and photo ops on a hanging bridge? If adventure is your middle name, this geopark tour just a few hours away from Manila is definitely for you! Masungi Georeserve is tourism with a heart --- it aims to protect the area’s jaw-dropping natural landscape and the unique flora and fauna found in it from illegal practices. Get those hiking boots on and let the adventure begin! A cultural tour with sustainability at its core: using uniquely designed and Filipino-made bamboo bikes, have a wonderful time through the historic walled city of Intramuros, Manila dotted with Spanish architectural houses and buildings, century-old churches, and historical museums. Burn the calories but gain a lot of insights about the Philippines! Take a deeper look into what the lesser-privileged yet resilient people of the metro endure every day, in an area called Bataan Shipping and Engineering Company Compound or more popularly known as BASECO. It’s more than just seeing but a chance to understand how they live and survive and still hope for a better tomorrow. Whether you’re looking for quirky, local stuff to buy as souvenirs or sample authentic cuisines, the Market Tour is a great way to do all these. Set around Old Manila, equal parts gritty and soulful, the tour takes you to the market area where all kinds of merchandise from local medicinal herbs, flowers, statues, clothing, and digital gadgets can be found. Delve into the religious aspect of the Filipino as well as you visit the Quiapo Catholic Church and the Islamic Golden Mosque. Round it up with sumptuous Chinese food at the Chinatown, touted as the oldest in the world. Nothing beats the buzz of strolling around stall-lined streets and striking up a good bargain. It’s the hunt for those eclectic treasures coupled with "I-can't-believe-I-found-this" moments that transform our local markets into an exhilarating experience. Spend a weekend excursion with Tanlines to off-the-beaten-path shopping locales around the metro that offer quirky, locally-crafted products at very affordable prices. Dapitan is our first stop. With its pop culture decor, home furnishings, and vintage finds, roaming around the area is like stepping into another era. Next, we’ll head on over to Dampa, the city's cleanest wet market to pick fresh seafood and tropical produce to fill our tummies. Ending with a bang, the mecca of Filipino bargains—Greenhills Shopping Center—is our last stop. Pearls, electronics, local handmade crafts—you name it, they have it.